Super-easy sweet potato curry, made with only a handful of ingredients. Ready in just over 30 minutes, perfect for a quick and nutritious family mid-week dinner! As we are approaching the end of the month, I thought I will squeeze one savoury recipe, which I hope you are going to love as much as I do! 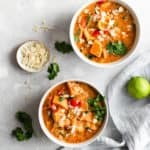 Sweet potato curry- easy, quick and healthy meal for all! That’s right. I’ve been having this meal on repeat last week, and I think once you try it, you may do the same! 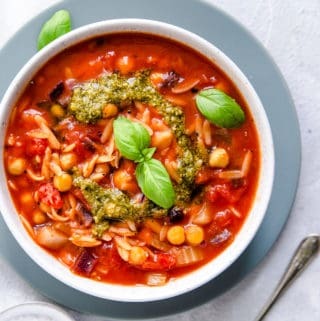 Made with eight basic ingredients, ready in just over 30 minutes and VERY budget friendly (less than £2.40 per portion!). What’s not to like?! Also, it’s vegan-friendly, healthy and nourishing. I guarantee it will keep you satisfied, without feeling sluggish or stuffed! It is an easy meal that the whole family will enjoy. Perfect for a mid-week dinner, or whenever you are short of time, but still want eat healthy and nutritious meal. I have based this recipe on my Sweet Potato and Chickpea Curry, but simplified it A LOT! Start with scrubbing your sweet potato. Why scrubbing it? The skin has lots of great nutrients and not having to peel them is a great time saver! Just make sure you wash them, so they are clean. Cut the sweet potato into chunks (about 2.5 cm thick), do the same for peppers and onions. 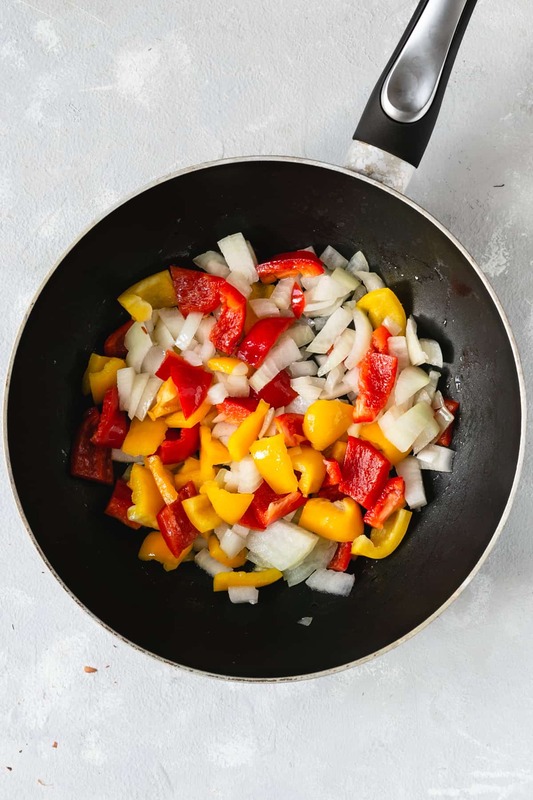 In a large frying pan, or a heavy-bottomed saucepan melt the coconut oil, then add onions and peppers, cover with lid and fry on a medium heat until soft (this should take about 8-10 minutes). After that, add the sweet potato, curry paste, coconut milk and stir it well. Cover with lid and simmer for about 20 minutes, until the potatoes are cooked through. Add coriander and top it with toasted almonds. Done! Serve it with some rice or naan bread on site and enjoy! As always, I would love to hear from you! 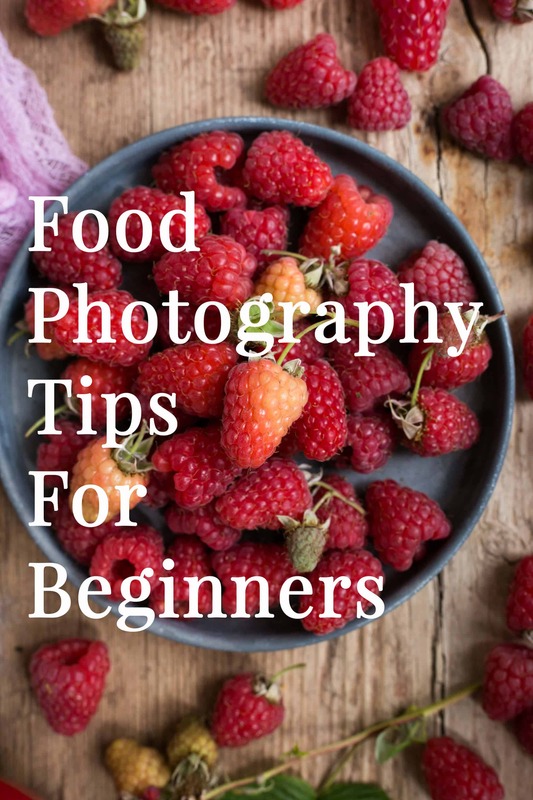 Let me know in the comments below if you have tried this, or any other of my recipes! 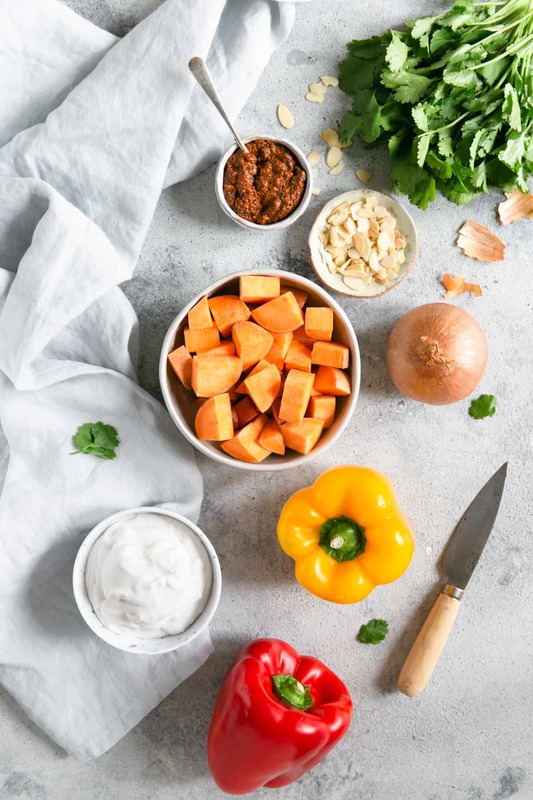 Easy, quick and very delicious recipe for sweet potato curry. Made with only handful of ingredients, this is a perfect dish for a mid-week dinner! In a large frying pan, heat the coconut oil, then add chopped peppers and onions and fry for about 10 minutes, stirring occasionally, until soft. Add the sweet potato, curry paste and coconut milk and stir well. Bring to simmer, cover with lid and cook for about 20 minutes until vegetables are very soft and begin to break up. Stir in half tbsp of coriander. Remember to subscribe to my mailing list so you can be the first one to hear about new posts and recipes! I promise I will NEVER send you any spam! Let’s be pen pals! This looks so good! We love quick and easy curries in our house and I’m always looking for slightly new recipe ideas to experiment with – this is definitely going on our meal plan! Thank you Corina! This one definitely ticks all the boxes, and I hope you will give this recipe a go! So easy, and crazy good! What a delicious sounding curry. A great meatless option that even meat eaters would love. Perfect for all this snow and cold weather we are having right now. Hey Gloria, thanks for stopping by! Totally, this is like a hug in a bowl, especially during these cold months! Sweet potato curry is one of my favorites. All the warmness of curry without the heaviness of meat. Sweet potatoes really do the trick to balance out that spice too. Thanks for sharing. Thank you Analinda! So glad to hear that you like the sweet potato curry too! And yes, totally agree, they are great alternative to meat and so versatile! I made a batch of curry paste the other week and have been kind out forgetting about it – This recipe comes at the perfect time! Love the almonds on top for a bit of crunch! Hey Kiki, thanks for visiting! And glad this recipe came in a good time for you! I hope you will put that home made curry paste into a good use now! This is such a comforting and delicious dinner for a cozy evening! Love this Recipe, Anna! ? 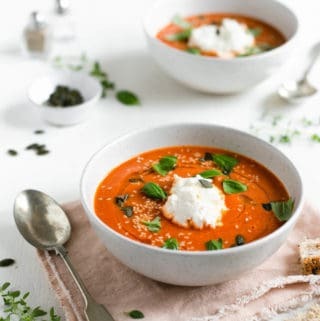 I love all the bright gorgeous veggies in this soup! Looks so comforting and healthy…all at the same time! Thank you Kelly, glad you like this recipe and I hope you will try it some time soon! Hey Michelle, thanks for your lovely comment and for stopping by! It’s such an easy dinner idea, and takes so little effort to make, which is my favourite type of meal! Always a bonus when it’s packed with healthy veggies! I’ve been trying to lighten up our meals lately with vegan or vegetarian options. Definitely going to throw this in the mix, it’s perfect for the cold weather!! I love that the ingredients are simple but not boring. Thank you Lauren, we’ve been doing the same, but trying to convince my other half to eat vegan meals have not been the easiest! He loves this one tho, which is why this dish is such a winner in my books! 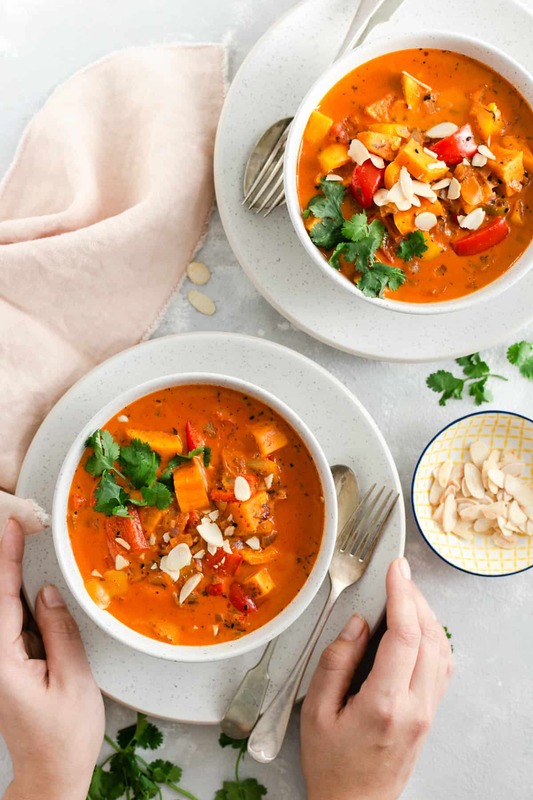 I am loving this sweet potato curry! Healthy and delicious and affordable, right up my alley! in addition, it is ready in less than 30. This is a keeper. 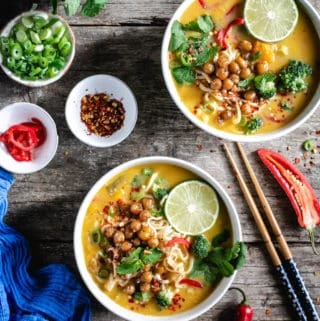 We prefer a lot of meatless or vegan meals, your curry recipe is going into our meal rotation! Hi Eileen, many thanks for your kind words on this recipe! Makes me happy to hear you will be giving it a try! It is a great alternative for the meat-free dinner, and I’m pretty sure even the non-vegans will love it! Hi Jo, thanks so much for stopping by and your comment! Glad you like this one! 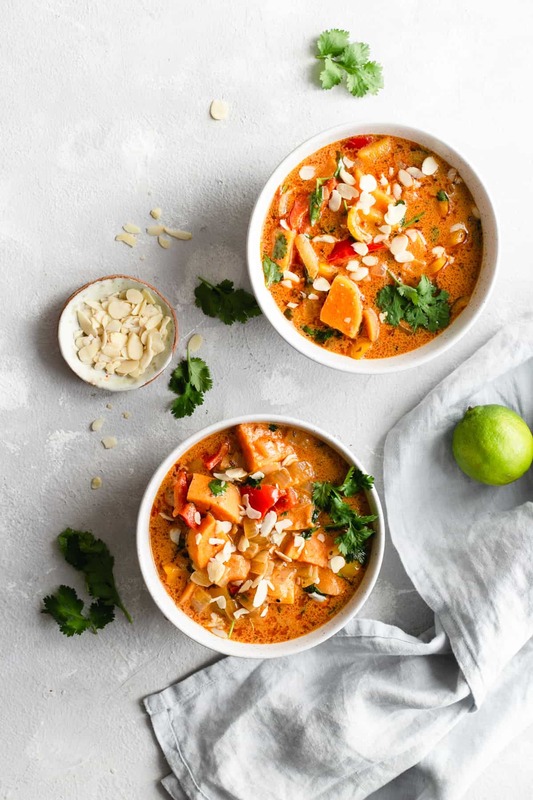 This sweet potato curry sounds divine! I don’t usually cook with sweet potato, but I might just have to make an exception for this! 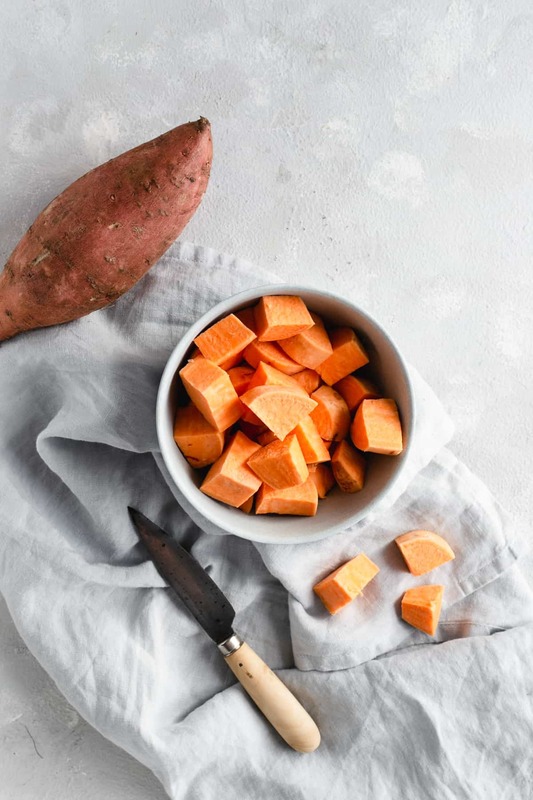 sweet potato is literally one of my favourite veggies, it is so versatile! 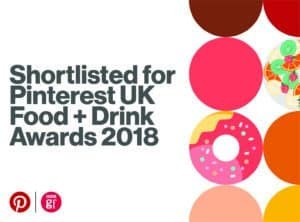 I really hope you will try it some time Claire, it’s too good to miss out on! We love love sweet potato curry, but I have never made with coconut milk. Your pictures are making me drool here, Definitely going to try your version of it as well. Hello Jagruti, thanks so much! 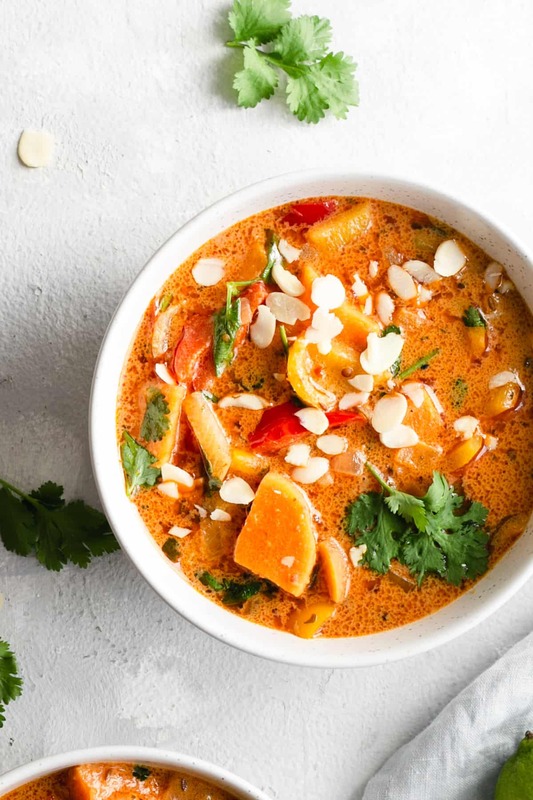 Coconut milk is a great ingredient, especially when it comes to curry! It lifts it up, adds lovely delicate flavour and balances out the spices. It also creates lovely texture! I hope you will try it some time soon! We eat lots of sweet potatoes and lots of curries, but I’ve never combined them together. Can’t wait to try this – I know my kids will love it too! Hey Julie! It’s such a great combo! I hope you and the family will enjoy this recipe!